Why do you worship Mary? – Me? A Catholic? I couldn’t believe what I thought I saw. Children brought flowers to the front of the church, and they placed them on the head of the statue of Mary. I was so upset at them worshiping Mary that I had to leave the church…and I was weeping. That’s where I was. I didn’t know what the Catholic Church REALLY believed about Mary. I had mistaken ideas. The truth about Mary was one of the most difficult ones I dealt with, but in the end, Mary has become a most comforting truth. ….. what I discovered about Mary…..
All this tied together with the idea of praying to Saints…praying to Mary. The person who was able to explain the actual teaching of the Catholic Church was Scott Hahn. I was given a set of cassette tapes he’d recorded. All of them were revealing and opened up the Bible to the truths I’d never seen before about many things…Mary, being one of them. Those tapes have since become books. Hail, Holy Queen is also the book used in a free Bible study available on Scott Hahn’s website, Salvation History. I’d recommend that highly!! I could never redo Scott’s explanations. Catholics do not worship Mary. We honor her. Jesus honored his mother and his father. We are called to do that in one of the 10 Commandments. I have photographs of my parents upon my walls and on bookshelves. When I look at those photos, I remember them and often I mentally speak to them. I am not worshiping them. I honor them and the memories I recall. This is what we Catholics do by having statues and photographs of Mary and other Saints. I ask people to pray for me when I have issues. My deceased parents, and friends are really more alive spiritually than they were alive here on earth. I ask Mary, and the Saints to pray FOR me just as I would if they were here on earth. They are close to God. They can hear the prayers of millions of people at the same time because they are in the spiritual realm, and not limited by time as we are here on earth. They have eternity to hear and assist us in our journey of faith. The Catechism of the Catholic Church is the authoritative source of what we believe about Mary, and every other matter of faith. You can use this search-able, online source for finding out what the Church REALLY believes and teaches. Back to the May Crowning of Mary…..this was NOT worship. It was giving honor to Mary for what she did for us. 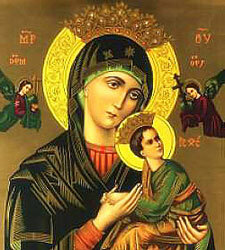 She said YES to God and became the Mother of God….the incarnation of God…God who became Man, the Man, Jesus Christ. There’s probably a lot more to be told about my relationship with Mary as a real person…not just a name in the Bible. She’s been patient with me. Like any good mother. This entry was posted in Mary and Saints and tagged Catechism of the Catholic Church, conversion, Mary, May Crowning, praying to Mary, Saints, Scott Hahn. Bookmark the permalink. It was hard to pray the Hail Mary after years of only needing to go to Christ myself. It wasn’t until I began to understand how much was left out of my understanding about the times of the early Church…because all I was going on was the Bible…the protestant version. Did not occur to me until I read John’s account that everything had not been written nor could be…his very last verse in his Gospel. Yes, I recommend Scott Hahn’s book as well! The early Church…that is a topic that I didn’t even know existed. In writing….so many are available. I just read in Acts this morning that the early disciples listened to the teaching of the apostles. We have the benefit of that teaching…handed down to us through the centuries. Wow. It was an obstacle for me at first. The more I learned about Church history, the more I realized that not asking Mary to pray for us is more foreign than my strange feeling when I first prayed the rosary.